The T-Type tapered roller thrust bearing is designed with a cage and roller assembly and two identical thrust plates. 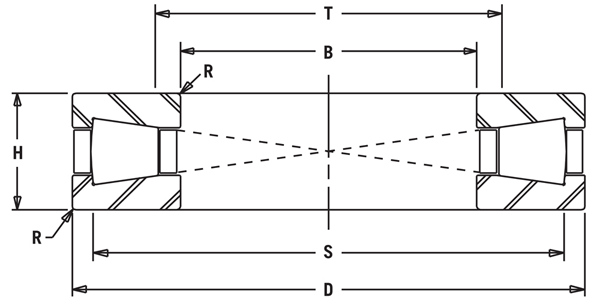 The rollers have a common vertex which enables true rolling motion within the thrust plates. The tapered roller design also allows for more rollers and therefore higher load carrying capability. A full complement version is offered for many of the standard sizes by eliminating the cage. In this full complement bearing, the addition of more rollers gives a greater thrust capacity. The added rollers increase friction within the bearing, making them better equipped for lower speed applications. These bearings are well suited to applications where high thrust loads and heavy shock load can be encountered, such as Crane Hooks. Other vertical shaft applications include rock crushers, and coal pulverizing equipment. They are also used in seed oil screw presses and protein extruders. Standard sizes ranging from 3” bore diameter to 16” bore diameter. They are dimensionally interchangeable with other manufactures tapered thrust bearings.